NEW YORK (AP) — The Philadelphia 76ers suspended rookie Jahlil Okafor two games Wednesday after the release of a second video provided details of his fight in Boston he hadn’t revealed to them. 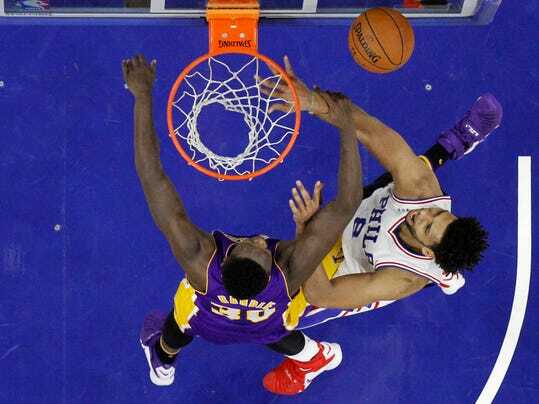 Coach Brett Brown said the organization wanted to show “tough love” toward Okafor, adding that he was surprised by what he saw in the new video posted by TMZ on Wednesday. “I think that if lessons are to be learned and this 19-year-old young man has to learn the responsibility of wearing a 76er uniform and carrying an NBA logo, and it has to be done in the magnitude and the national media spotlight as it has been delivered to make our point, then I say that’s not a bad thing,” Brown said before the 76ers faced the New York Knicks. The second video showed Okafor fighting in Boston the night of a loss to the Celtics last month, prompting local police to urge anyone who was assaulted to come forward.